Variation in the timing of plant phenology caused by phenotypic plasticity is a sensitive measure of how organisms respond to weather and climate variability. Although continental-scale gradients in climate and consequential patterns in plant phenology are well recognized, the contribution of underlying genotypic difference to the geography of phenology is less well understood. We hypothesize that different temperate plant genotypes require varying amount of heat energy for resuming annual growth and reproduction as a result of adaptation and other ecological and evolutionary processes along climatic gradients. In particular, at least for some species, the growing degree days (GDD) needed to trigger the same spring phenology events (e.g., budburst and flower bloom) may be less for individuals originated from colder climates than those from warmer climates. This variable intrinsic heat energy requirement in plants can be characterized by the term growth efficiency and is quantitatively reflected in the timing of phenophases—earlier timing indicates higher efficiency (i.e., less heat energy needed to trigger phenophase transitions) and vice versa compared to a standard reference (i.e., either a uniform climate or a uniform genotype). In this study, we tested our hypothesis by comparing variations of budburst and bloom timing of two widely documented plants from the USA National Phenology Network (i.e., red maple-Acer rubrum and forsythia-Forsythia spp.) with cloned indicator plants (lilac-Syringa x chinensis ‘Red Rothomagensis’) at multiple eastern US sites. Our results indicate that across the accumulated temperature gradient, the two non-clonal plants showed significantly more gradual changes than the cloned plants, manifested by earlier phenology in colder climates and later phenology in warmer climates relative to the baseline clone phenological response. This finding provides initial evidence supporting the growth efficiency hypothesis, and suggests more work is warranted. 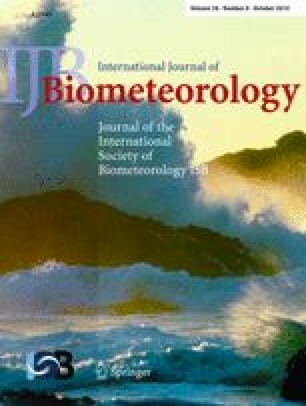 More studies investigating genotype-determined phenological variations will be useful for better understanding and prediction of the continental-scale patterns of biospheric responses to climate change. In different occasions when a part of these analyses were presented to academic audiences, Scott Gleeson and William Hargrove provided helpful feedback. Jonathan Philips, Julio L. Betancourt, Susan Mazer, and Alison Donnelly reviewed the entire manuscript and provided valuable comments. We are grateful to these individuals for their help and support. Red maple, forsythia, and cloned lilac phenological data since 2009 were provided by the USA National Phenology Network and the many participants who contribute to its Nature’s Notebook program. Cloned lilac phenological data prior to 2009 were provided by the USA National Phenology Network, Joseph M. Caprio, Mark D. Schwartz, and all contributors to past US Department of Agriculture regional phenology projects. Finally we thank two anonymous reviewers for their helpful and constructive comments.